This year's tax updates have proved to be challenging, to say the least, but this seems to be the norm now rather than the exception. Whilst the Office of Tax Simplification seem to be focused more on making tax returns easier for the majority of individuals, this is actually leading to much more complicated and confusing legislation, which is becoming harder to model over time. Below are just some of the provisions that have been added to JCS recently. This year sees the first time that Scottish Parliament has set different rates and thresholds for Scottish taxpayers from the rest of the UK. The only change this year is the threshold at which individuals start to pay higher rate tax on earned income, however, this hides a whole level of complexity that now needs to be taken into account when calculating the tax liability of a Scottish taxpayer. As the Scottish higher rate threshold is only applicable to non-savings and non-dividend income (earned income), any savings or dividend income must take into account the UK tax rates and thresholds, meaning that a Scottish taxpayer with both earned income and savings income is subject to both Scottish and UK rates and bands at the same time. Due to a quirk of the actual thresholds set for this year, an individual with both earned and savings income, could in theory, be liable to (Scottish) higher rate tax on their earned income, but only pay (UK) basic rate tax on their savings income. This is likely to cause confusion if an individual's earned income falls within the band of £43,000 - £45,000, and also has savings or dividend income. Below is a worked example demonstrating this quirk, which can be replicated in JCS if desired. John is a Scottish taxpayer with an salary of £43,002, and bank interest of £1,500 in the tax year 2017/18. His total taxable income is £44,502, but his personal allowance of £11,500 reduces this to £33,002. He will pay income tax at Scottish rates and thresholds on his earned income, but will pay income tax at UK rates on his savings income. His earned income is taxed at Scottish Basic Rate (20%) in the band £0 to £31,500. Then at Scottish Higher Rate (40%) in the band £31,501 to £31,502. John's marginal tax rate is now 40% (according to Scottish rates and thresholds). He then needs to consider his savings income of £1,500 at UK rates and thresholds, but taking into account the income already taxed at Scottish rates. The UK Basic Rate falls in the band £0 to £33,500, but his earned income at Scottish rates has used up the first £31,502 of this band, leaving an available band of £31,503 to £33,500. Since John is not a higher rate taxpayer (according to the UK threshold of £33,500), he is entitled to a Personal Savings Allowance of £1,000 which is taxed at 0% but uses up the basic rate band. His savings income will be taxed in the UK Basic Rate band (20%) of £31,503 to £33,003, where the first £1,000 is taxed at 0% due to the Personal Savings Allowance. The tax calculations in JCS have been carefully tested to ensure that they follow the updated tax legislation for Scottish Income tax, both now and for future tax years. It has also been made ready for plans for devolution of tax to Wales in 2019. The 2017/18 tax year sees the introduction of the controversial Lifetime ISA. The latest version of JCS will now allow the creation of a number of different ISA types, including the Lifetime ISA and the Innovative Finance ISA. We see the Lifetime ISA as being one of the few products (other than pensions) that has been specifically designed to provide for income in retirement, and as such JCS allows you to include Lifetime ISAs in the Income in Retirement calculator, in the same way as DC pensions can currently be included. When used in this way, the 25% government bonus will be automatically applied to all future personal contributions for planning purposes. In the 2016 budget, two new allowances were announced to take effect from April 2017. Both of these were intended to make the reporting of tax easier for individuals with low levels of income from either property, or goods and services. It means that if an individual's income from these sources is less than £1,000, they do not need to include it on their tax return at all. However, if their income from these sources is higher than £1,000, the individual can elect to either use the allowance as a straight reduction of their income (no expenses are taken into account in this option), or calculate the reported profit based on income less expenses. An individual must elect to use these allowances, and there may be situations where the individual will decide to either elect to use the allowance, or not use the the allowance, even though the decision may not be financially beneficial to them (such as reduced time and effort involved in expense receipts etc). For this reason, JCS does not automatically make use of these allowances in the tax calculations, unless they have been selected in the "Tax Allowances" section of client Fact Find. If any of your clients are likely to make use of these allowances, make sure you review the options available in this section. 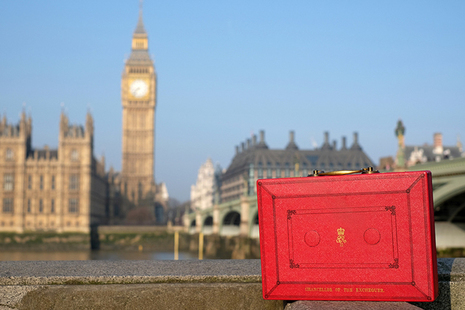 In the 2017 Budget, the Chancellor confirmed that the MPAA for pension contributions would reduce from £10,000 to £4,000 with effect from 6th April 2017. 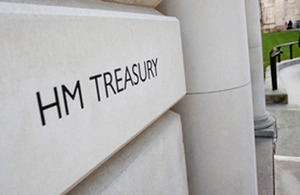 However, when the Finance Act 2017 was given Royal Assent at the end of April, this is one of the provisions that was removed in order to ensure the legislation could be completed before Parliament was dissolved in the run up to the General Election. The Budget release of JCS initially included the reduction to £4,000, but this will be reverted back to £10,000 in the May 2017 release to reflect current legislation. It should be noted that the reduction in the MPAA still remains government policy, according to the Treasury, and depending on the outcome of the General Election, the MPAA may still be reduced with effect 6th April 2017. This uncertainty is not very helpful for planning purposes, but we will ensure that JCS is updated promptly when, and if, any changes are announced. With effect April 2017, individuals are now able to make use of the new Residential Nil Rate Band (RNRB) when calculating Inheritance Tax liability. Unfortunately, the way RNRB has been implemented in legislation does not make for a simple calculation. JCS has been updated significantly in the inheritance tax area to handle RNRB, transferred RNRB from a deceased spouse, downsizing addition, and how the total amount of RNRB can be tapered away for estates in excess of £2 million. The maximum RNRB available in 2017/18 is restricted to £100,000, increasing to £175,000 by 2020/21. If you have not seen the detailed IHT computations from JCS, have a look in the Estate Planning and Wills section of the Fact Find. Inheritance Tax calculations in JCS have had a number of improvements recently. Some of these are clearly visible if you have used this functionality before, others are a little bit more subtle. This is one of the more obvious updates. The Residential Enhancement for Nil Rate Band came into effect April 2017, allowing an individual up to £100,000 of extra Nil Rate Band where a qualifying property is closely inherited. This will rise incremently to £175,000 by 2020/21. The residential enhancement available to an individual will be tapered by £1 for every £2 that an individual's estate exceeds the Taper Threshold of £2 million. For individuals that have sold their main residence and purchased a smaller property that is valued less than the maximum residential enhancement in that year, their RNRB may be increased by calculation of their downsizing allowance. The inclusion of the Taper Threshold has required that certain assumptions made in JCS in the past are no longer valid. Previously, a joint IHT calculation in JCS assumed all assets would be inherited by the surviving spouse, and that 100% of Nil Rate Band would be transferred to the surviving spouse. Meaning that the estate is the total of the couple's assets, and the NRB available would be 200%. This was a fairly simple model that worked for most scenarios, including gifts brought into charge on first death. The joint IHT calculation model in JCS is now slightly different. It requires that an individual IHT calculation is performed for both client and partner, to determine the size of each estate respectively. This will determine any impact on the RNRB available due to the Taper Threshold, and thus any transferred/unused RNRB passed to the surviving spouse. Therefore, the joint calculation is now actually the IHT calculation on the second death, where transferred RNRB is restricted by the estate of the first death, transferred NRB is the remainder of NRB from first death after gifts in the last seven years have been brought into charge, and that 100% of the estate is inherited by the surviving spouse. This change in how JCS now calculates IHT, allows some new functionality to be exposed to a planner. Previously, it was only possible to perform an individual IHT calculation if a client had been entered into JCS without a partner. Now, it is possible to perform an individual IHT calculation on either the client or the partner. The estate value for client and partner is based on assets owned by each respectively, where joint assets are deemed to be owned 50/50. Calculation of gifts in the last seven years is based on which of the couple was the donor, joint gifts are deemed to be 50/50. These scenarios will show the effect of either the client or partner dying on the day of calculation, on the assumption that 0% of the deceased's estate will be transferred to the surviving spouse. In other words eliminating the IHT exempt transfer. Joint calculations were previously based on the assumption of the eldest of the couple dying first. The order of death can affect the outcome of the IHT calculations due to factors such as gifts that come into charge on death, payout of life policies not held in trust, payout of death benefits from a pension scheme etc, and there was no way to customise this without modifying the age of the clients in question. The last scenario is obviously a duplicate of one of the first two scenarios, and is the default scenario used within Profile Reports. With the updated model for joint IHT calculations, the final calculation is that of the second death only. This calculation will only bring into charge any gifts from that individual, and so will seem to be ignoring gifts from the individual that died first. This is now factored in through the amount of unused NRB available after first death that can be transferred. On first death, gifts that are brought into charge will use up the Nil Rate Band (including any unused NRB from a previous spouse), and will affect how much can be transferred to the surviving spouse. If the value of gifts brought into charge exeed the total NRB available, the unused NRB available for transfer will be zero, and there will be IHT due on the first death. This charge will be added as an additional amount to the total tax due in the second death calculation. Using this model it is possible to simulate the scenario where up to 400% of NRB can be utilised. The example below can be modelled within JCS. Bill dies in August 2017, leaving an estate of £750,000 to his wife, Sally. Within the last seven years, Bill had made total gifts to his children of £650,000, he is entitled to 100% transferred NRB from his previous wife who died in 2001. Bill's total NRB percentage is 200%, which in 2017 is £650,000. Total assets chargeable to IHT are £750,000, plus £650,000 in gifts. However, the estate will be inherited by Sally and so is exempt. The remaining £650,000 fully utilises the NRB, leaving zero transferred NRB for Sally. Sally dies later in the same year, with an estate of £750,000. Sally made no gifts in the last seven years, but she is entitled to 100% transferred NRB from her previous husband, who died in 2005. Sally's total NRB percentage is 200%, which in 2017 is £650,000. Total assets chargeable to IHT are £750,000. £650,000 of this is charged at zero, due to the Nil Rate Band, the remaining £100,000 is charged at 40%. As a couple, the total amount charged at nil rate is £1,300,000, or 400% of Nil Rate Band. Any discussion about IHT calculations in JCS would not be complete without mentioning exempt gifts and how they are handled in the JCS model, as these are often misunderstood and entered incorrectly. Annual Exempt gifts should always be entered into JCS as Potentially Exempt Transfers. JCS will automatically allocate the first £3,000 of gifts per year to be exempt (both client and partner exemptions will be allocated). Even if a gift to the value of £12,000 was entered, the first £3,000 would be marked exempt, and the remaining £9,000 would come into charge upon death. If no gifts were made in the previous year, or the annual exemption was not fully used, this will automatically be carried over for one year to increase the annual exemption for that year. Annual Exemption gifts are always handled in the calculations and are carried throughout the entire calculation. If they are not entered into the list of gifts, as "they are exempt, so I don't need to", then JCS will apply the annual exemption to other gifts that have been entered instead. Other Exempt gifts, are gifts that are completely exempt from IHT, and so can be left out of the calculation completely. These would include gifts to charity, gifts to spouse, gifts for weddings etc. JCS still allows a user to enter these gifts for record keeping purposes, but they will never form part of the IHT calculation. The Internet seems to be awash with notifications of security vulnerabilities and leaking of details these days. A lot of these vulnerabilities have been based around the SSL and TLS encryption protocols, which are starting to get a bit long in the tooth now. SSL was first invented in 1994, and TLS in 1999, and as time marches on, the earlier versions of these protocols are slowly but surely being replaced with newer ones. Product Providers are constantly altering the security requirements on their websites and web services and dropping support for the older protocols, meaning that if your computer does not support the newer protocols and is not configured correctly, you will not be able to use these websites and services, including Contract Enquiry. Last year, we recommended that users disable the early protocol versions for SSL and TLS, and only use TLS 1.2 as this is really the only secure protocol left in the SSL/TLS family. All others have been compromised. Unfortunately, Product Providers have not been quite so pro-active in either adopting the new versions, or dropping old versions, and this has led to some users being unable to connect to certain Providers. With this in mind, our latest recommendations are a little bit more pragmatic. SSL is now deemed to be an insecure protocol, and can be easily compromised. Whilst a few platforms and providers still support SSL, they all support newer protocols, so there is no requirement to use these ever again. TLS 1.2 is the only remaining secure protocol, however there are a number of providers and plaforms that have still not adopted either TLS 1.1 or TLS 1.2. Therefore, to ensure that you can still connect to all providers and platforms you will need to be able to use all three of these protocols. 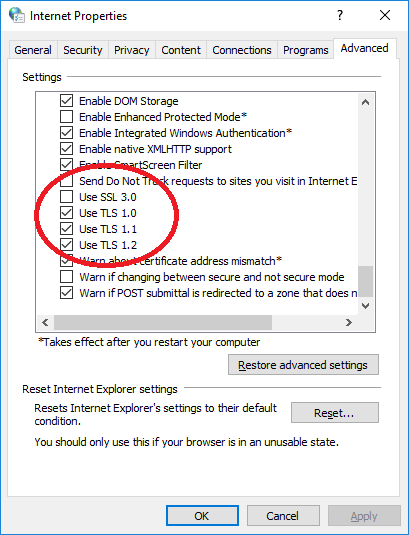 By having all three TLS protocols enabled, your computer will always attempt to connect using the latest and greatest, and downgrade only as required based on the remote server. The above settings can easily be located in Windows 10 by clicking on the Windows "Start" button and typing "Internet Options". Once you open Internet Options, click on the "Advanced" tab and scroll all the way down to the bottom of the settings list. Simply select/de-select the boxes mentioned above and then click the 'Apply' and 'Ok' buttons to save the changes. In recent years, we have had comments from several users that, although they might be happy with the content of JCS reports, in terms of look and feel, they left much to be desired. With their excessive use of bold and italic text, as well as the decidedly old fashioned looking Times New Roman font, JCS reports were looking dated, and sorely in need of a style makeover. As there are literally hundreds of reports produced by JCS, updating them all has been a mammoth undertaking, but as of JCS version 26.010.03 (released in January 2017), we are proud to introduce the ability to pick and choose from a number of different contemporary report "themes", in a manner that will probably feel quite familiar to users of the more recent editions of Microsoft Office. Gone is the antiquated Times New Roman font and ugly decorated text, and in its place you’ll find clean, modern-looking fonts, with a variety of colours to pick from. If you have not seen or used these new themes, check them out in Preferences, within JCS. You can see live previews of the themes on a mini sample report, before deciding which one to actually use. Hopefully there is one that works for you, which complements your corporate branding. If not, don't panic! We are adding to the list of themes all the time, and would also be happy to work with you to add a style with your specific corporate colours. We have done this already with a number of early takeup adviser firms during our testing phase. Want to stick with the old look? Don't worry, it hasn't gone anywhere, it is still available under the suitably titled "JCS Classic" (we thought “Classic” an appropriate name for something which looks like it belongs in the age of floppy disks and punch cards). "...we were very pleased with the reports and they look so much more professional and contemporary. Our clients were pleased too and we went one step further by getting cardboard covers [of client packs] printed which finished the quality look off." We are pleased to confirm that following a recent review by Ofcom of geographic and non-geographic call number charging transparency, JCS has followed their recommendations and has adopted an 0345 number to ensure that our customers do not get hit by hidden call charges. Our numbers remain the same but now have prefix of 0345. The 0845 number will still work but our recommendation is for you to start using the 0345 number. For most customers an 0345 number is cheaper than using an 0845 number.